Void is a digital-only release and is available at Rebernation. The album is also available on iTunes, Spotify and other major digital outlets. Void is the second 2017 release from Dave Jensen, aka Intellessence, and he’s already prepping his next album for an April 2018 release. Earlier in 2017 he released Mesmer, which was reviewed here. Intellessence is a one-man show, Jensen performing all the instruments and vocals as well as the engineering and production. 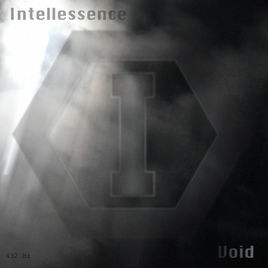 Musically, Intellessence is a mash-up of multiple influences that congeal into its own distinctive sound. The space rock of Hawkwind, the urgent doom-romanticism of the Cure, the cosmic drift of Pink Floyd, the modern psychedelia of Ghost of a Saber Tooth Tiger, the violent angst of Nine Inch Nails and the cold whimsy of Dream Academy are just some of the touchstones. Thematically the lyrics plumb the depths of the human psyche. It is after all, a new era where there are no facts, no truth, no inspiration; only cold, hard humanity and the quest for profit. So how do the remaining humans with some semblance of empathy survive? Void is a big step forward from its predecessor, revealing much more in the compositions and arrangements. Although Jensen’s intent was to create an overarching mood, there are stylistic departures that evoke a range of emotional responses. Perhaps a good way to describe this music is “beauty in sadness.” Throughout there are frequent references to storms, rain, clouds, memories (or lack thereof) and frequent use of the word “nothing.” The sky as a metaphor for the expanse of emotion. All these are draped in chorus-laden guitar tones, minor-chord piano figures and layers of synths. It’s droning and meditative qualities are pierced by rays of light. The album’s epic centerpiece is the 11-minute “Silent Storm.” Here a melodic vocal line is sung alternately in the left and right channels while rain and air-raid sound effects heighten the tension. The song encapsulates the album’s mood with lyrics like, “With no one to touch, no one to hold me / Everything seems so cold and empty,” and “I wish for a memory to someday be here.” The single guitar lines are reminiscent of Disintegration-era Cure and there is a really nice guitar build in one of the instrumental sections.